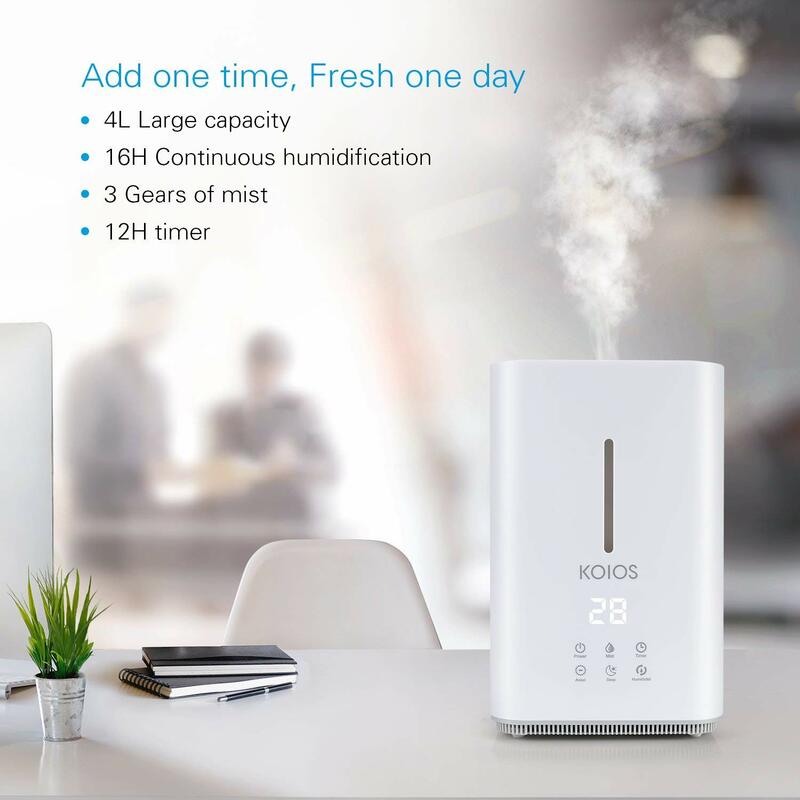 【Perfect for Home and Office】Koios humidifier has 4L large capacity and supports 16 hours constant work, which could bring you all day freshness with only one time water filling, and the machine will automatically stop working when no water remained. 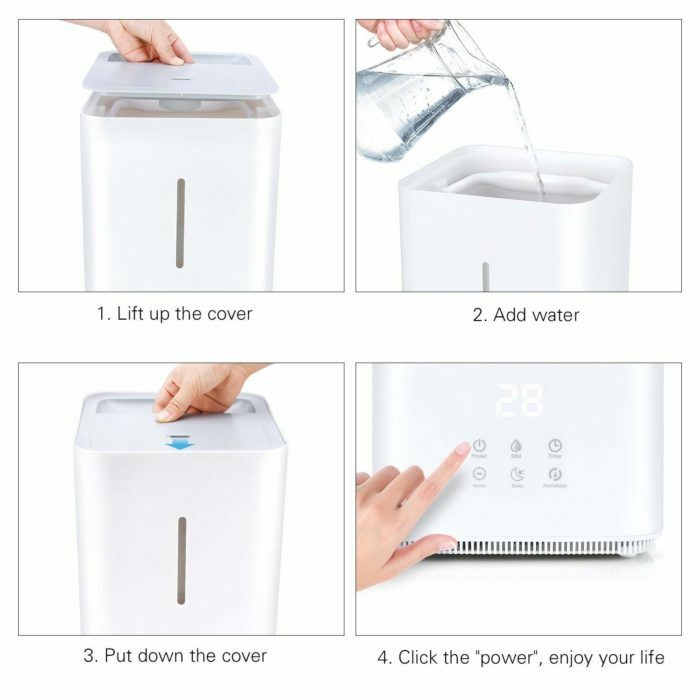 【Top Fill Water】 Add water from the top directly or put forward the water tank to add water, which are convenient and effectively avoid water leaking. You can add water into top fill humidifier at the same time watching your favorite TV show. 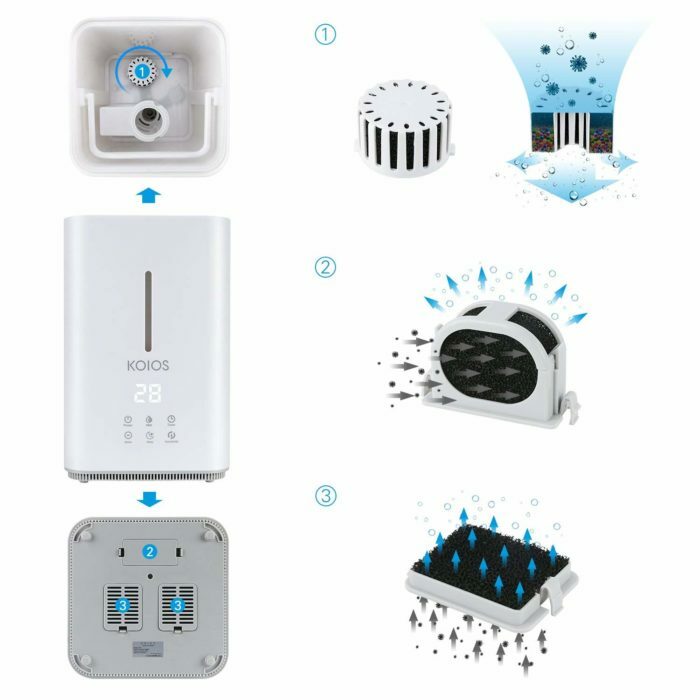 【Multi-Function】6 smart touchable buttons in cool mist humidifier with 6 modes. Real-time humidity on the screen and 3 adjustable mist levels. Humidistat mode to keep the right humidity. Sleep mode offer a comfortable environment for your sweet dream. Anion function produces fresh anions Timer can be programmed from 1 to 12 hours. 【Open Water Tank】The wide opening water tank makes it easy for you to clean every nook and cranny of the tank completely. 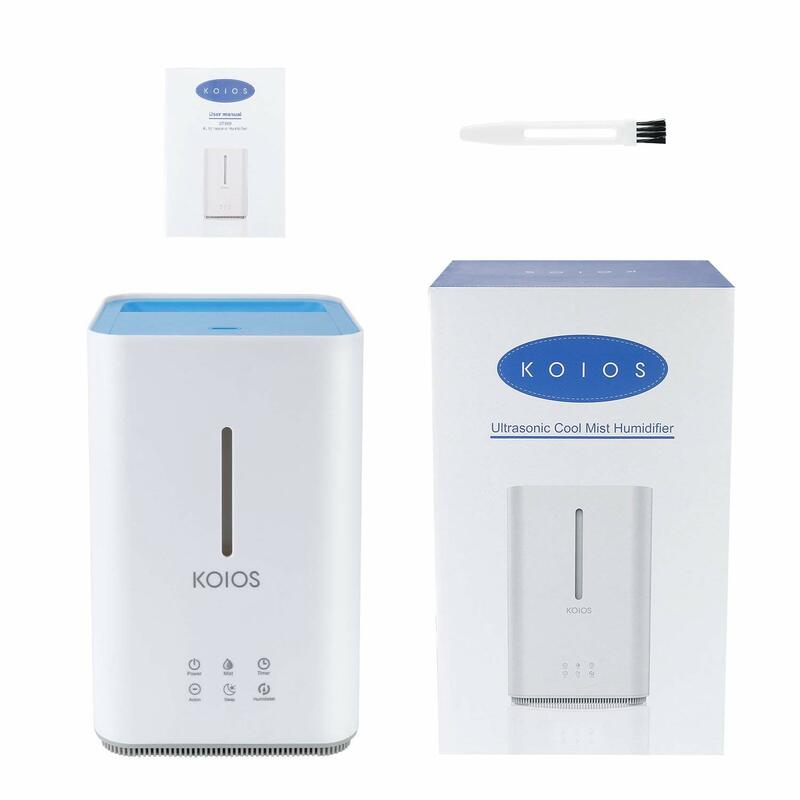 Built-in cotton filters purify water before it is diffused. Three air filters under the humidifier clean the air wind. 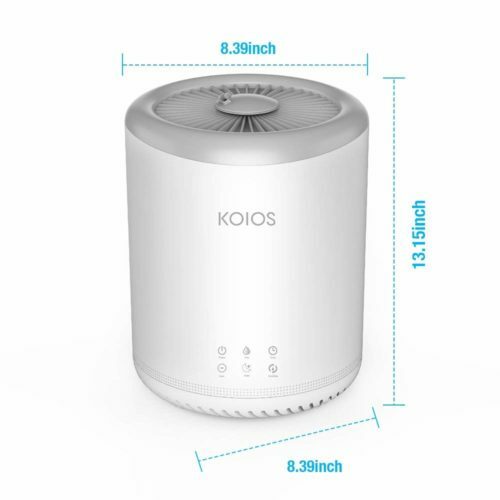 【Ultra-Silent】The whisper-quiet humidifier is very quiet in the operation, which won’t interrupt your working or ruin your sweet dream. 【NOTE】Please wait for 30-60 seconds after you put the water tank into the base to turn on the humidifier at the first time. And the EI code indicates no water in the tank or fail in misting, there is the solution to EI code in the description part. Koios humidifier decreases the risk of illness and disease and helps relieve dry, irritated skin, to ensure your home’s optimal humidity level. 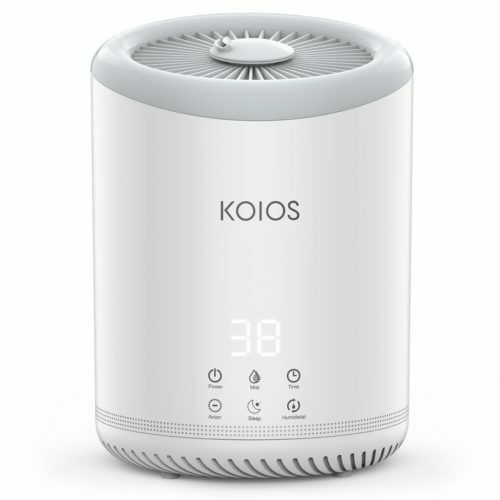 With a large 4L tank, powerful mist output, this aesthetically pleasing humidifier is packed with smart features that make it the perfect solution for improving your room air quality. Control the mist amount with low,middle,and high settings. 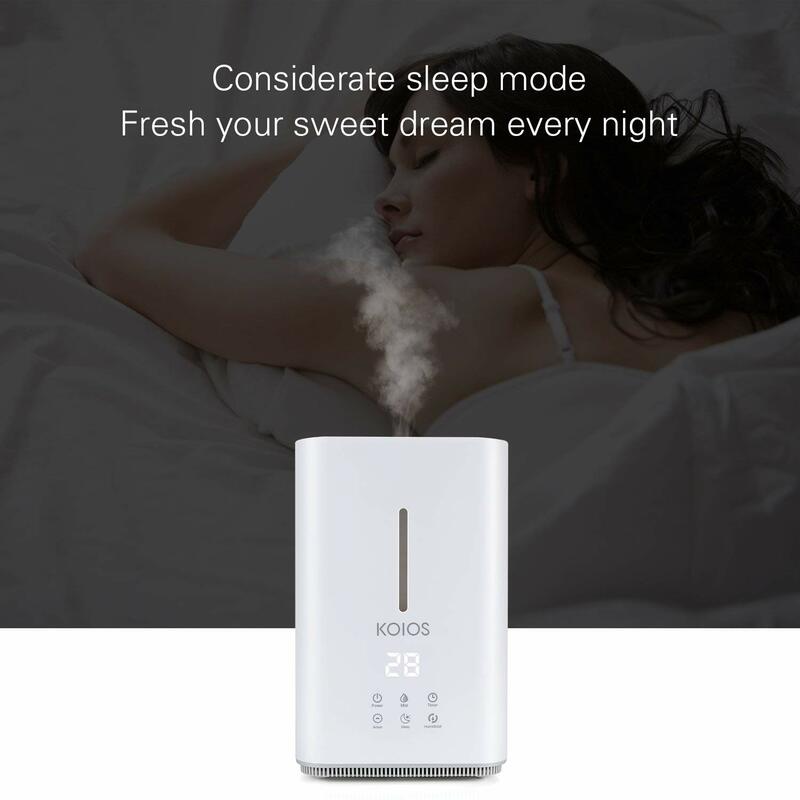 Indicator light will be dim and whisper quiet, and offer a comfortable environment for you, when the sleep mode is open. 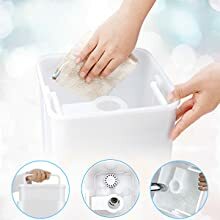 Because of the wide opening design, you can clean every nook and cranny of the water tank completely by your hand directly, instead of harmful chemical agents. 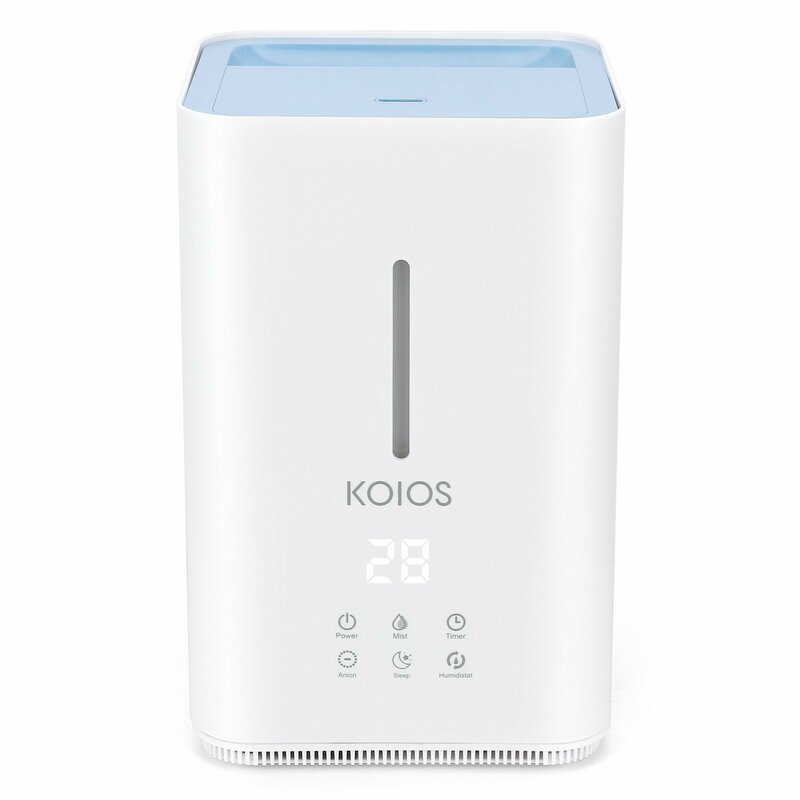 Features a built-in timer that can be programmed anywhere from 1 to 12 hours; the humidifier will automatically turn off when the timer has finished counting down. 1.Take out the brush below the water tank and try to start it again, sometimes the brush is not in the proper position. 2.Pour enough water into the tank and set aside for 30 seconds to 60 seconds, let the water goes down to touch the atomized tablets, then power on the machine. 3.Please check if the water tank is placed into the base completely. 4.Please note that do not pour water into the tank through the mist outlet which will stop the running of the machine. If you can not still solve the problem, please message or email. 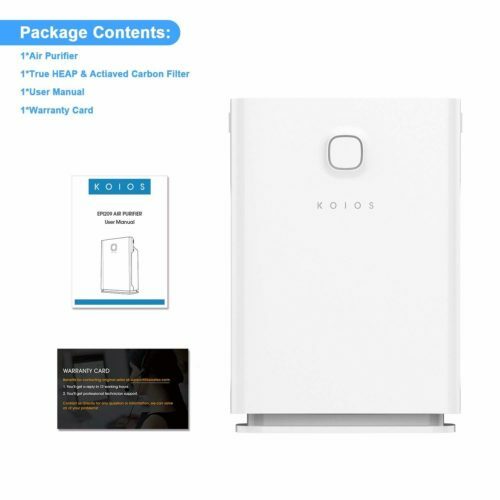 Question: Does this have an ionizer? Answer: sure, one of our six function button is anion which could produce negative ion to keep fresh. Question: Is there a warm mist feature? Answer: No, there isn’t a warm feature. Question: Why is water pouring out of the front on the machine through the vertical opening above the logo? Answer: It has too much water in it. That happened to me at first. Then I started putting less water in it. Question: Can I leave the unit on and will it know when to shut off, turn back on, or adjust humidity mist release based on humidity in room? Question: I am getting an E1 error code…not mentioned in the manual. Anyone know how to fix this? Question: What are the dimensions of this product? Question: where can i buy the filter? Nice product and very fast responding customer service. Exactly what I was looking for. Runs quiet, and for a couple of days. Easy to make adjustments, nice features. 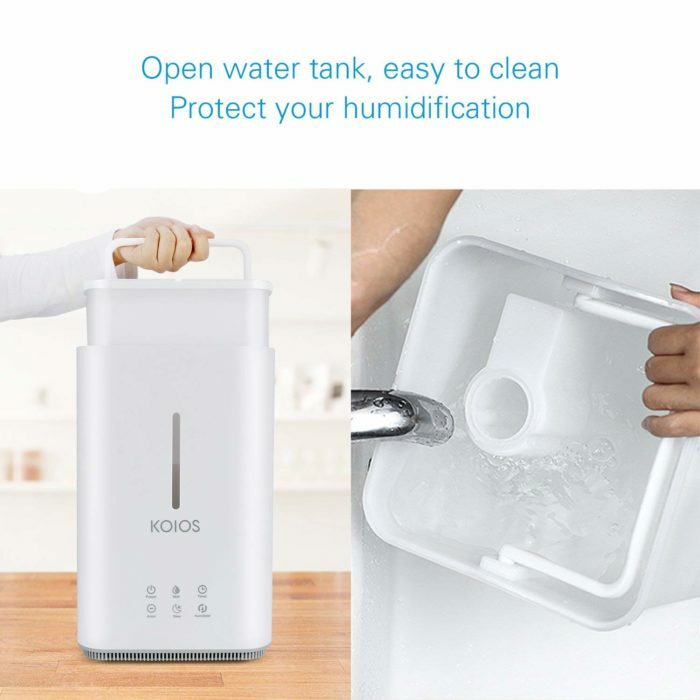 This is my third humidifier and definitely the best. Very easy to fill and quiet. I do wish I could shut the lights completely off. Love. Love. Love. 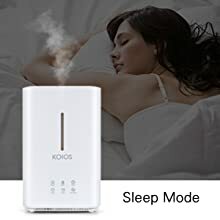 This is one of the best humidifiers I have ever used. 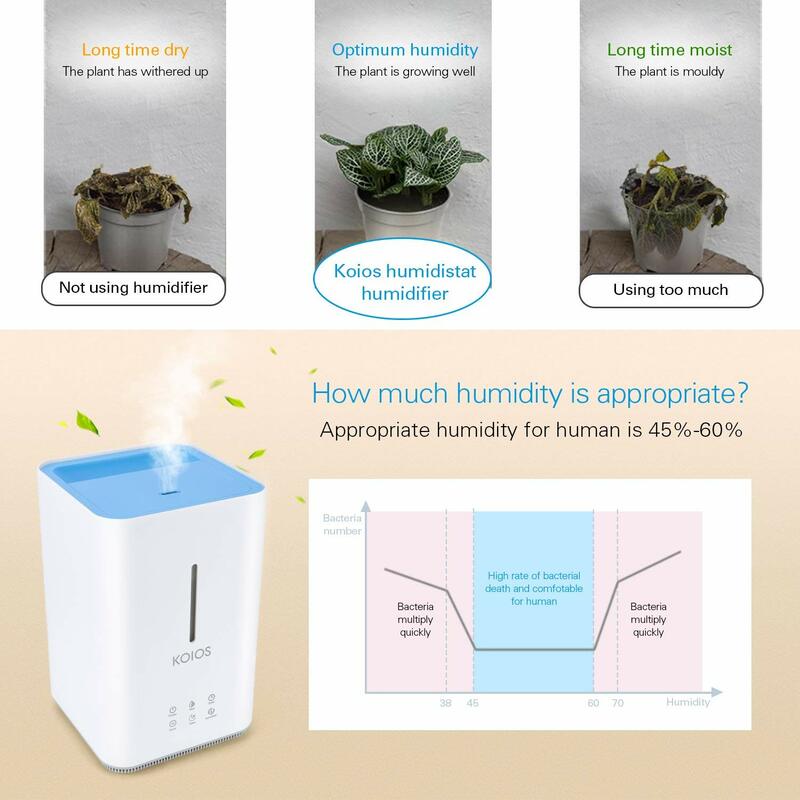 I use this humidifier for some of my house plants that like high humidity. 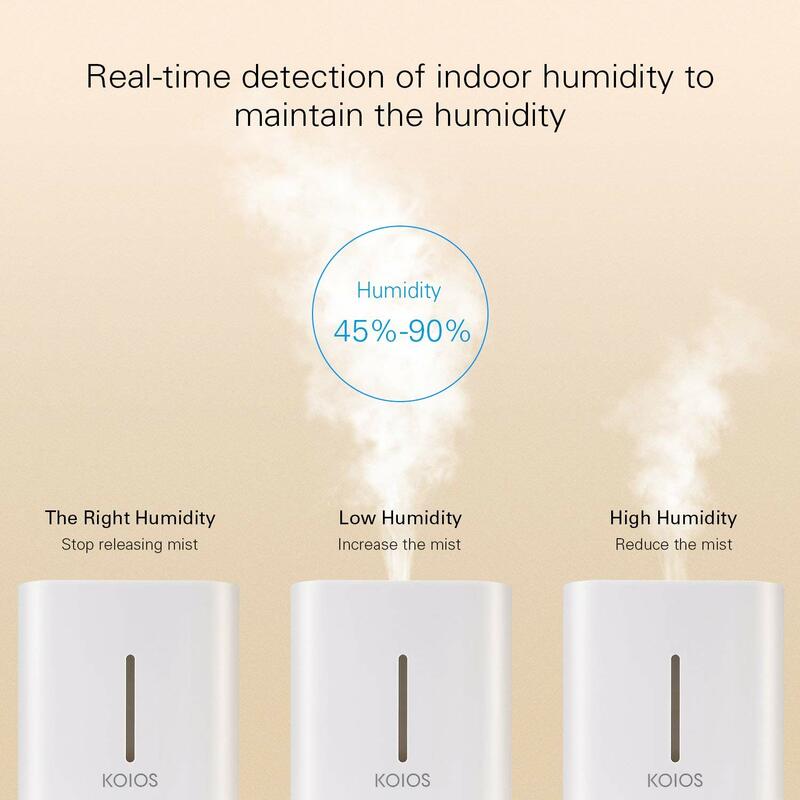 It has several settings to allow me to control the humidity level. I like being able to fill it from the top. So far so good, I had to drill a small hole in the top handle area because it was collecting water. It took about 5 days to get the humidity up to 17% from 9% in a 400 sq ft room. It is very quiet. So far so good, it’s nice and quiet. The 4l water tank can last long more than 12 hrs. 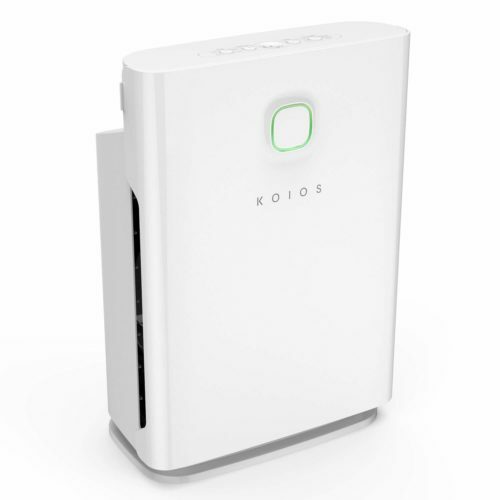 it has decent mist output and will notify you when the water near empty. This is an amazing product! It saved my life! No more awful nights with my poor daughter, she is having better nights since we got this humidifier! I highly recommend It! This has been an excellent humidifier to have around the house. It does a good job keeping a bedroom at a pleasant humidity level. It is very quiet, and I can run it in the bedroom at night and it will not bother me at all. The reservoir is also the perfect size – we run the humidifier at night for sleeping and a full tank can last three nights. But it’s not so big that it’s bulky and heavy. I also like the controls, they are intuitive and easy to use. The humidity sensor is a nice bonus. It’s also pretty easy to clean, all of the parts are accessible. 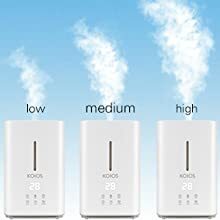 Best cool mist humidifier I ever used. Hope it last for few years. 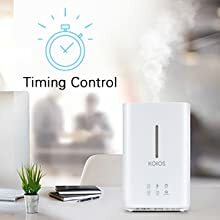 Bought this Humidifier last week, It is better than what I expect. All you need is open the top cover, take out the bucket fill up with water and put it back. that is all you need to do. Easy and simple. and you could control the room moisture. One more thing I like the best is the floor are dry after use, unlike some other brand I have to wipe the floor every morning,the floor is wet around the machine after use.